God cares about what we think. In fact, He gives us a list of the types of things He wants us to think about. So, it makes sense that we can use this list as a filter for what we are thinking. True: God wants to make sure what we think about is true. So we must test our “truths” against God’s Word. We are told to “follow your heart,” but God wants us to follow Him. “Believe in yourself,” but God wants us to believe in Him. Honorable: If we cannot say it out loud in the middle of a church about a pastor’s wife, we should not dwell on it. Instead we need to focus on the things that bring glory and honor to God. Just: Are our thought fair? Or are we blowing a circumstance out of proportion because we are hurt? Or are we skewing the situation to make ourselves look good? We must ask God to help us think justly. Pure: Is there even a hint of nasty in our thoughts. Are we entertaining impure sexual fantasies? Are we focusing on gossip or slander? Lovely: Do my thoughts lighten the heart, encourage me to do kind things for others? Do my thoughts make it easier for me to rely on the Holy Spirit so I can please God? Commendable: Do my thoughts encourage me to help others? Do they increase my desire to draw closer to Jesus and please Him more? Excellent: Are my thoughts valuable to myself and others? Do they challenge me to live a holy life through the power of the Holy Spirit? Worthy of Praise: Would God, knowing our thoughts, say, “well done. I not only approve what you are thinking, but I applaud it?” If not, then we need to refocus our thoughts. 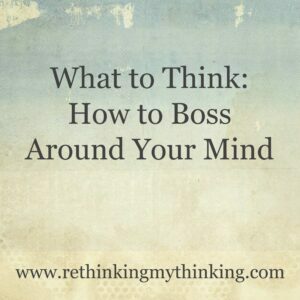 Sometimes our minds will run a bit wild, but we can be the boss of our thoughts. The key is to filter our thought focus through this verse. May our thoughts bring glory and honor to God. May they encourage us to love God and others well. All for God’s glory and honor! 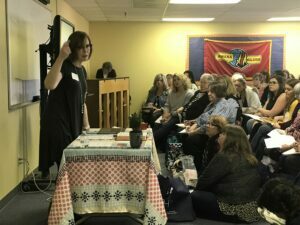 This past weekend I had the privilege of leading two break-out sessions at Arkansas Baptist Women’s Inspire Conference. 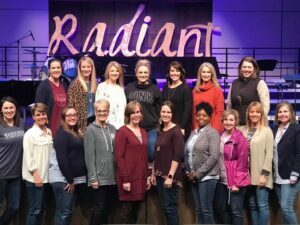 What a blessing it was to see about 900 women from all over Arkansas gather together to receive encouragement, correction, refreshment, and learn to fall more in love with Jesus. 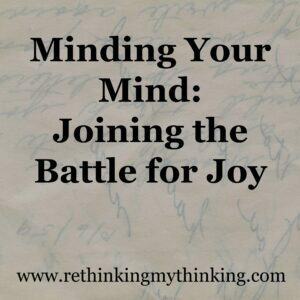 The session I led was called Changing Your Mind: How to Radiate Joy. By God’s grace and a few women willing to sit on the floor, I spoke to about 275 women total. We discussed what joy really is and how our thought life can either cloud the joy we have in God our help us keep our eyes focused on God. Today I want to share a bit more about the battle we enter with God when we choose to wrestle our thoughts into obedience with God. So we must do battle to bring our thoughts captive to Christ’s obedience; to remember that our fullest joy comes in God’s presence. Since His Spirit dwells in us, we should have no problem being in God’s presence! So how do we do this battle? We pray God helps us pay attention to our wandering mind. We tell our thoughts the truth. We remind ourselves that even when we cannot feel it God’s presence brings joy. We tell ourselves joy from anything else will not last. We ask God to help us experience the joy of His presence. By His power we can break away from the strongholds in our minds that keep us far from God and the joy of His presence. So today take some time to evaluate you thoughts. Sift them through the truth of God’s Word, keep what is pure and holy, throw out what is rubbish, and begin to battle for the joy of the LORD! Hope. We long for it and fear it. We excitedly soar on the wings of possibility only to crash to the ground when what we expected or hoped did not happen. But God promises a hope that will not end in a spectacular crash, a hope that will does not put us to shame. This hope is not some pie in the sky, dream. It is hard won on the battlefield of suffering, endurance, and proven character. It is hope that God is near, in us, with us, working around us. The God who created the stars in the sky and holds the universe together in all its intricacies, He is near enough to work things out according to His perfect plan and purpose. His nearness changes everything. It provides light in darkness, direction in confusion, and possibility in seemingly impossible situations. In those dark places He whispers encouragement and correction, we only need to listen. This hope comes as our character is forged in the fires of suffering. It is a hope stronger than steel, purer than silver, and certain because we know the God who promised is faithful. So when darkness covers all we can see, we get to decide. Will we keep searching for the light, knowing God’s light is coming? 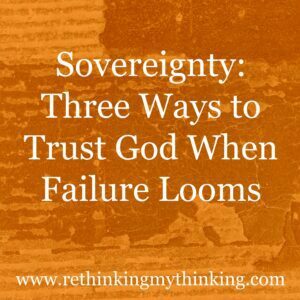 Will we cling to the hope that God’s ways are best, He has plans for our good and His glory? 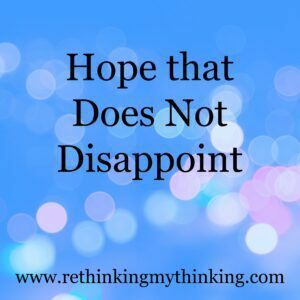 Or will we place our hope in things that disappoint? Will we boss around our emotions and our minds? Or will we let our fear and worry steal our joy and hope? Our God is able, He is strong, He owns everything so He can do anything. And when He choses not to do something, we have to trust His ways are best when our hope is in Him. Father God, help us to choose to hope in You. Help us to see how you are working and trust that Your ways are best even when we do not understand. May we remember Your promises and Your plans so we remember our hope will never put us to shame. In Jesus’ Name we pray. Amen.